It didn't take long before the carnage in the hit house-party movie "Project X" spilled onto the real real estate market. 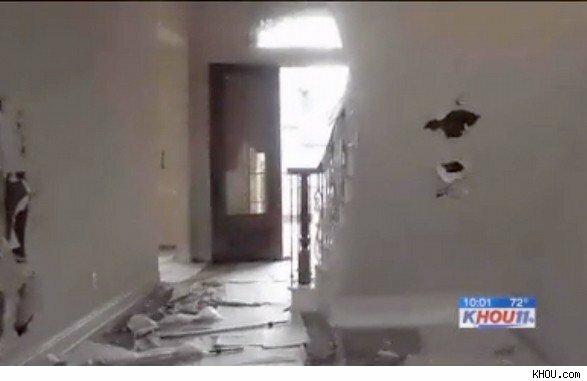 Thirteen teenagers are being questioned for their possible involvement in a wild house party that will cost the builder nearly $100,000 in repairs, reports KHOU in Houston, Texas. "It's devastating. This is a new home that was ready to sell," said private investigator Mark Stephens, who was hired by the homebuilder to observe the property. Stephens estimates the home to be worth $500,000. A tour of the once pristine, 4,000-square-foot-home today reveals gaping holes in the walls, heaps of broken glass and liquor bottles strewn across the property. Stephens told KHOU that the night after the property was vandalized, he returned to the neighborhood in the hope of catching the culprits in the act. Just down the street, in another vacant home, he came upon a group of teenagers throwing another massive party. Police took 13 teenagers into custody, with two minors being young enough to be released back to their parents. Stephens said that when he asked the teens why they broke into the home, they simply said "Project X." Yet this isn't the first time the riotous teen flick reportedly has inspired copycat revelry. Another party in Houston turned deadly after an unidentified teen was shot multiple times at an illegal party in another vacant home, ABC News reports. The party, which drew between 500 to 1,000 high school and college-age students, was shut down by police, but the gunman reportedly escaped on foot. An underlying problem in these and other cases of home vandalism is the glut of vacant homes sitting idle on the market. As foreclosures have flooded local real estate inventories, vacant properties have attracted all manner of blight, lowering property values and putting more financial stress on already struggling neighborhoods. And the vacancy problem could continue to rise. Despite a new report that shows a 13 percent drop in completed foreclosures in the first month of this year, as compared to January 2011, there are signs that foreclosures could soon rise. With the $25 billion mortgage settlement finally underway, experts expect foreclosure activity to increase through 2012, as banks begin to clear a massive backlog of disputed foreclosures. One in every 637 homes received a foreclosure filing in February, according to RealtyTrac. In Houston, where both wild parties took place, one in every 689 homes received a foreclosure notice in February -- up nearly 10 percent from the previous month. Despite a steep drop in sales, the Raleigh-Cary market saw considerable price appreciation last year, with its median sales price for single-family homes jumping 7.3 percent from third-quarter 2010 to third-quarter 2011. At $224,300, the Raleigh-Cary metro had the highest median sales price among the 10 markets on this list and was the only market with a median sales price above the U.S. median. Nonetheless, its affordability rate stayed above the national level, with 73.6 percent of its homes affordable to households earning the area's median income, according to the National Association of Home Builders/Wells Fargo Housing Opportunity Index. Like Raleigh-Cary and other markets on this list, home prices in the Wichita metro area weathered the housing downturn comparatively unscathed. "Inventory has been up and sales have slowed, but values have been relatively unaffected," said Mike Grbic, associate broker and owner of Mike Grbic Real Estate Experts -- Select Homes in Wichita. The Wichita metro's median sales price rose 5.5 percent from third-quarter 2010 to third-quarter 2011, to $120,900. For 2011 as a whole, the city of Wichita posted one of the top 10 year-over-year median sales price hikes nationwide, up 17.2 percent, according to a chart provided for this report by Onboard Informatics. The Rochester metro area had a 6.9 percent jobless rate in November, compared to an 8.2 percent rate nationwide. The area has seen employment grow 2.8 percent since its fourth-quarter 2009 trough, while employment in the nation as a whole has risen 1.3 percent during that time. The metro has one of the top 20 fastest job growth rates nationwide, according to Brookings. Of 100 major metro areas, Rochester is one of only 22 to have regained more than half of the jobs lost between its pre-recession high and post-recession low, the think tank said. While Rochester has long been associated with the Eastman Kodak Co., the area's economic performance no longer depends on the declining fortunes of that company. The Des Moines-West Des Moines metro area had a 5.3 percent unemployment rate in November -- among the lowest rates in the country. Moody's predicts the area will see a further 2 percent jump in jobs from third-quarter 2011 to third-quarter 2012. "Strong Midwestern values, a highly educated and productive workforce, and the culmination of many years of cooperation between civic, corporate and government make the greater Des Moines area an attractive city to call home (and an) oasis of prosperity," said Brian Wentz, an agent at Burnett Realty in Clive, a suburb of Des Moines. "That has attracted and retained top employers and led to many years of sustained growth, with no end in sight." Located between Nashville, Tenn., and Atlanta, the Chattanooga metro area enjoys a low unemployment rate, high affordability, and the highest rate of out-of-state in-migration among the 10 markets. The area's median sales price rose 7.3 percent in the year through third-quarter 2011, to $128,700. The vast majority of homes in the area, 81.3 percent, were affordable to median-income households during that quarter. "One of Chattanooga's largest resident communities, (which) historically had enjoyed 3 to 3.7 percent on an average differential between list and sales price ... increased (to a) 4 to 4.9 percent differential from 2010 to 2011," said Linda Brock, an affiliate broker at Prudential RealtyCenter.com in Chattanooga. Read the full list of markets to watch here.